GEMS. TRUST. WILD. For more than 170 years, the Constantin Wild company has been offering top-class gemstones. The connoisseur of exquisite stones has a worldwide reputation for his exclusive portfolio. Visitors to this year’s Baselworld will have the opportunity to see why: endless facets, fascinating colours and very high quality. The company's treasure chamber is home to some of the most spectacular beauties on Earth. Every stone is hand-picked and has been through a series of thorough tests. The Value of Colours: "Great Temptations"
"Great Temptations" – such are the stones Constantin Wild is now presenting. 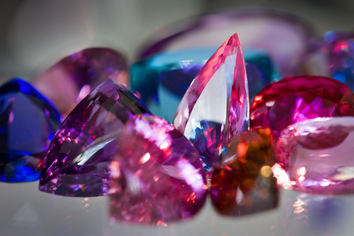 Coloured gemstones like these are very rare and mostly unique: That also makes these thoroughly individual jewellery and collector's items very suitable as secure investment. The value of Colours: "Imperial topaz, the 'emperor from Brazil'"
Only the imperial topazes from Ouro Preto have that incredible colour play, shine and sparkle, that no other pink, orange or yellow pure topaz can achieve. Three years ago the "emperor" was an almost forgotten stone for aficionados - now it's en vogue. The Value of Colours: "more than just rare"
The premium line „more than just rare“ presents outstanding and extremely valuable rarities: The highest quality and a perfect cut are expected as matters of course - besides type, colour, size and a stone's history, origin, availability and shape. The Value of Colours: "Beauty is it!" The collection „Beauty is it“ presents extravagant sets and includes astonishing compositions:classical sets with stones of the same type and cut but different sizes, same-colour combinations, and combinations with complementary colours or different cuts.